On this page we describe first creating at the sqlite3 prompt a database containing names of countries and the date of their last election and then a form-based application to display the data in DBEdit and DBDateEdit components. The application enables you to edit, delete and insert records. When we added the date 16/03/2014 for Serbia, we continued after the warning about possible data corruption. 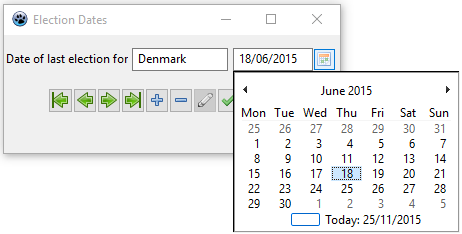 (The DBDateEdit component does not allow a blank field so it does not clear the previous contents, which you can replace with the election date of the added country). The Pascal code of the unit (showing the components used and the code to commit changes to the database) and the text view of the form (showing you how to link up the components) follow the screenshot of the application in action.